The hippest women, men—and, for all we know, even a set of seriously fashion-savvy children—are currently all wearing Saint Laurent's New Wave 98 California Sunglasses (£215). Round frames and reflective finishes may be well-loved by the sleek A-list crowds across the globe, but the coolest corners of planet fashion have their eyes firmly set on this particular eyewear prize. Why? Well, it could be that they appear to reference one of the most iconic sunglasses collections of all time: Kurt Cobain's. 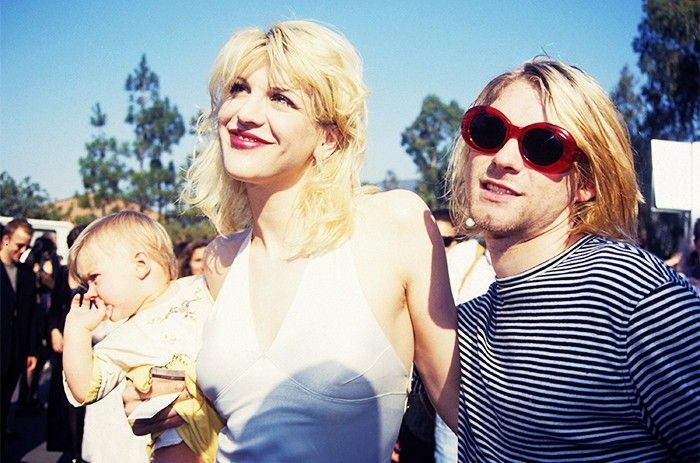 Kurt Cobain with Courtney Love in 1993. Saint Laurent's New Wave 98 sunglasses first hit the runway for the brand's S/S 16 menswear show— a collection which was inspired by Californian surf music culture—but Cobain, alongside his signature plaid shirts and mussed-up bleach-blonde hair, made these kind of oval-shaped frames an integral part of his enduring '90s look, owning them in an array of colours and going through a phase where he was very rarely photographed without them. Our new style crush, Anteros lead singer Laura Hayden, has them in white. So does Parisian fashion insider Letitia Paul. Harry Styles is also part of the crew, and we've spotted countless male fashion editors following his lead. A very similar style from Saint Laurent is now available in the sales. Kurt Cobain was also partial to a spangly pair of sunnies. Wear this pretty shade of pink with something grunge-inspired. Classic black is also entirely acceptable. Will you try this trend? Shout out in the comments box below and shop for more new-in shades if you're still looking.